Based on William Brinkley's popular novel of the same name, The Last Ship chronicles a global catastrophe that nearly decimated the world's population. Due to its positioning, the Navy destroyer U.S.S. Nathan James and its passengers avoided falling victim to the devastating tragedy. Now, the crew and its captain must confront the reality of their new existence in a world where they may be among the only remaining survivors. 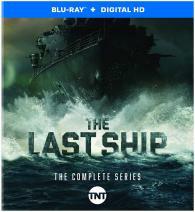 Special Features:Never-before-seen roundtable discussion with show creators and Naval experts discussing the development of the series as well as the collaboration with the U.S. Navy throughout all five seasons, behind-the-scenes featurettes, an inside look at various episodes and a 20-minute documentary showcasing how season four follows Homer’s The Odyssey with Vincent Farenga, Professor of Classics and Comparative Literature at University of Southern California.